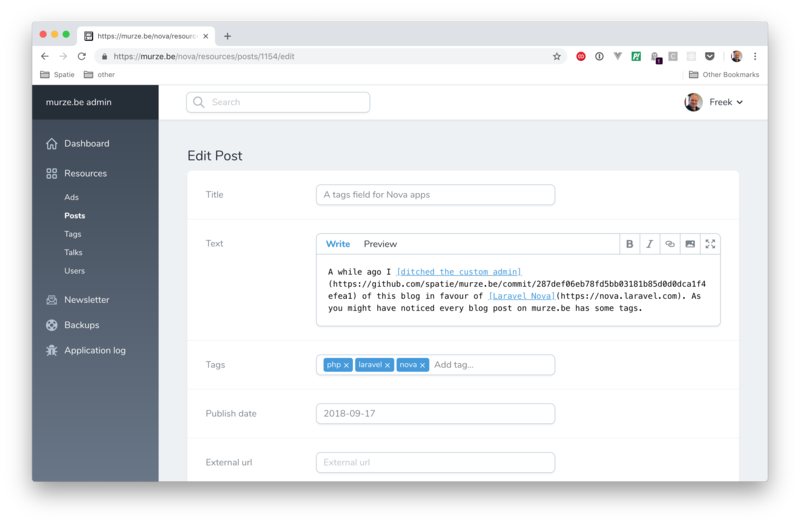 A while ago I ditched the custom admin of this blog in favour of Laravel Nova. As you might have noticed every blog post on murze.be has some tags. Nova ships with many form fields but a field to use tags is not included out of the box. That's why I created my own tags field and released it as spatie/nova-tags-field. In this post I'd like to introduce it to you. Using the tags field is very easy. You just have to add it to your Nova resource. The first tag field will now only suggest existing authors, the second one will suggest existing subjects. If you want to allow only one tag the be picked, you can use the single method. The field will be rendered as a select form element. It will be populated by the names of the tags already saved. If you want to perform crud actions on the save tags, just create a Nova resource for it. Here's an example. Under the hood our nova-tags-field package will call these methods too. Even if you're not into Laravel Nova, you probably will find something for your next project in this big list of packages my team has made previously.